Central to mobile payments is the mobile wallet, the consumer-facing platform that acts as a front end for wider mobile payment services and functionality. Deploying a mobile wallet platform capable of integrating future technological changes and remaining flexible to market developments is central to the long-term positioning of banks and other providers in the mobile payments space. Few banks will have the resources or desire to create a mobile wallet platform from scratch, and white-label mobile wallet providers are poised to help meet this demand by integrating into bank payment infrastructure more effectively. Payment providers must choose the white-label mobile wallet platform that best supports their specific needs and strategic goals. This report is an update to a title published in 2014. Ovum has updated the previous report to reflect the technology and commercial changes that have swept through the mobile wallet space. This report provides a reference guide for payment providers by profiling the leading platforms and vendors servicing the emerging global market for white-label mobile wallets. Following the development of technologies such as tokenization and host card emulation (HCE), the growing interest in the use of open APIs in financial services, and the commercial dynamics of a changing digital landscape, the possibilities engendered by mobile wallets continue to open up and pose significant potential for issuing banks and potential wallet operators. This has led to the emergence of the white-label mobile wallet platform, offered by an increasing number of vendors to banks, telcos, and retailers alike. As mobile wallets are software-driven platforms, any organisation with the time and resources to spare could effectively build their own from scratch. However, not all organisations will have these resources, and even if they do it may take them considerable effort to gain the same functionality as existing off-the-shelf white-label platforms, including for ensuring device compatibility and meeting shifting security requirements. Ovum believes that the mobile wallet space is now entering the next major phase of development, particularly given the launch of OEM payment platforms such as Apple Pay and Samsung Pay. Rather than waiting for the launch of one or two wallets that will dominate the wallet space, the market is instead shifting towards a highly fragmented state of enabling payments across many platforms and services simultaneously. In such an environment, the need for white-label platforms is greater than ever, as issuers and other payment providers seek to increase their mobile wallet capabilities as efficiently as possible. Despite the years of hype, mobile wallets are only now really starting to get a foothold, and banks more than ever need to consider their mobile wallet platform needs and the strategic implications of this longer term. multi-pronged approach of enabling payments and supporting consumers to use a range of services across a range of mobile platforms simultaneously. The growth of the OEM “pay” platforms and digital wallets is helping drive market growth, and in many instances can work in conjunction with issuer-branded, white-label mobile wallets. 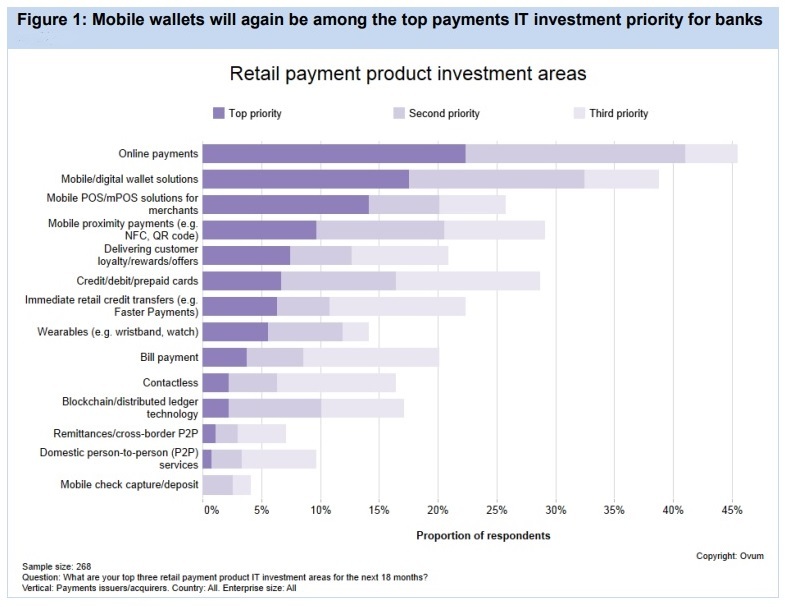 Investment in mobile wallet platforms remains a top priority for over a third of issuers globally. The white-label mobile wallet space is also fragmented, with many major vendors’ activities restricted to their respective geographic regions. functionalities, with a heavy focus on integration, configuration, and customization through APIs (application programming interfaces) and SDKs (software development kits). models; however, most deployments continue to occur on either an on-site or hosted basis. The market for white-label mobile wallet platforms remains extremely competitive, with most vendors offering a high degree of capability. A focus on innovation and flexibility will be critical to long-term success in the market. There remains ample scope for all of the white-label mobile wallet platform vendors profiled here to dramatically shift their market positioning in the near term as the wider mobile wallet market continues to gather pace.